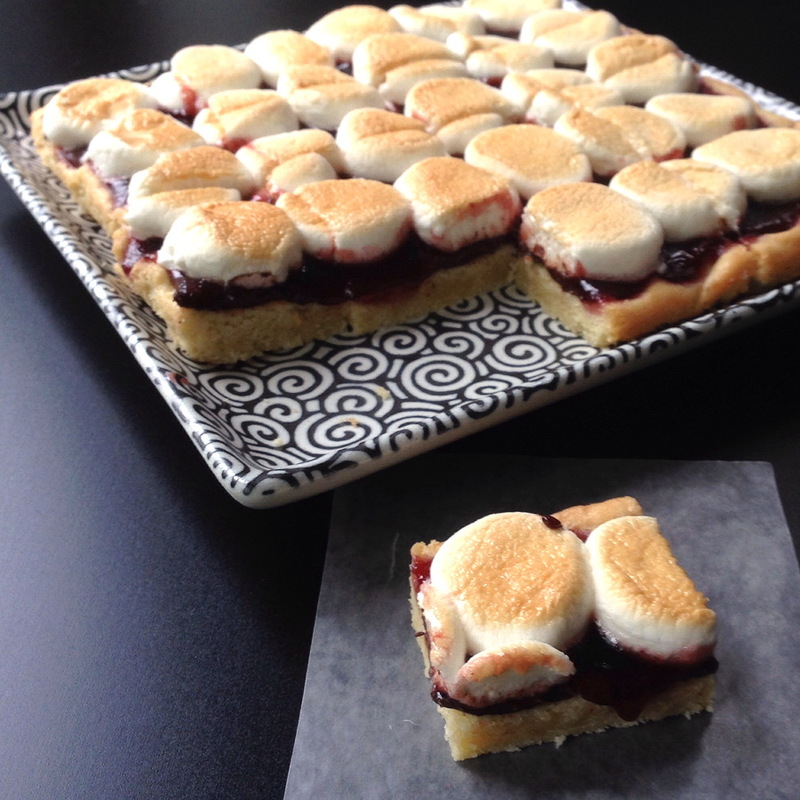 #Cookielicious Adaptable Marshmallow Bar Cookies - Get the Good Stuff! I love an easy bar cookie, don’t you? Even better is one where I get to use up the remnants of an open jar of jam. These cookies are inspired by and adapted from Joy the Baker – and they remain a favorite in my family. They’re cookielicious! The absolute best thing about them is that they’re so flexible. If I want chocolate, I add in a layer of it – but sometimes I’d prefer butterscotch, or Nutella, or my hubby really hankers after peanut butter. Just think of the cookies as layers of goodness – start with shortbread, add in what you like, end with marshmallows. It’s a choose your own adventure in edible form! This recipe is published as a part of the #Cookielicious Exchange Party from the SundaySupperMovement. Join us for a #Cookielicious chat at 7 p.m. ET Tuesday, Dec. 1, on Twitter. We will be sharing tips for cooking baking along with stories about our favorite family recipes. Follow the #Cookielicious hashtag and remember to include it in your tweets to join in the chat. To get more great cookies recipes, check out our Cookie Jar Pinterest board. “mmm those look good” – words my husband said as your page was loading on my computer. I think they sound delicious and are such a wonderful idea for any time of the year! Sometime I might try mini marshmallows instead. I can just imagine these with PB under the jam and marshmallows… goober fluffernutters!! I know people who would love those! I love anything with marshmallows! Thanks for sharing! Happy to share these. There’s only one problem: they’re addicting. These look fabulous! I love everything about them! And you can make your own variations! I’ll be interested to hear what creations get made. I’m with your hubby….make mine peanut butter please. I’m a huge fan of Joy the Baker! Love her recipes and this one looks so good!! Thank you for sharing! I’ll take mine with chocolate! They look delicious!